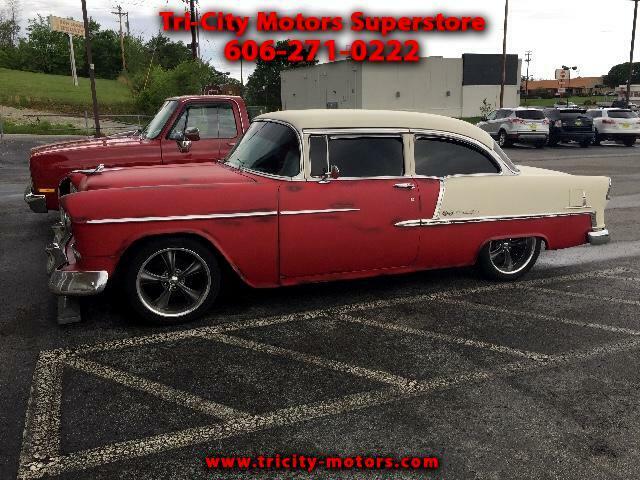 THIS IS A TRUE BEL AIR 1955 CHEVY CAR. IT HAS A 4 SPEED OVERDRIVE TRANSMISSION, HEADER AND 4 BARREL CARB. THE CAR HAS A FLAT TWO TONE RED/WHITE PAINT WITH THE PATINA FINISH AND A FLAT CLEAR FINISH. THE CAR HAS AIR CONDITIONING, POWER BRAKES, POWER STEERING, AND TILT. THE CAR HAS NEW RITTLER WHEELS WITH 18'S ON THE FRONT AND 20'S ON THE BACK. THIS IS A GREAT CRUISING CAR. THE BODY IS NICE AND SOLID WITH NO RUST AND HAS LED FRONT AND REAR LIGHTS. Message: Thought you might be interested in this 1955 Chevrolet Bel Air.